For months I’ve been thinking about a beautiful salad that my friend Greg of SippitySup made. I was quite taken by his use of lemon slices as a main ingredient. I think this is brilliant! Inspired by Greg’s salad, I created this super tasty recipe, which is very different, but I hope somewhat as delicious and as gorgeous! This is a lovely vegetarian side or entrée salad. And you could also add some protein — like chicken — to turn it into a hearty meal! I did that the other morning to bring to my parents for dinner. By lunchtime, however, there was only about a half of a serving left. Oops! You’ll never guess what I’m going to suggest. . .
Yup, get the Salt Roasted Chicken going to have on hand to add to this salad over the weekend! In a small bowl, mix the yogurt, honey, lemon zest and vinegar. Set aside. When you cut your lemons (here's how), be sure to save all of the scraps to squeeze juices from, over the salad later. 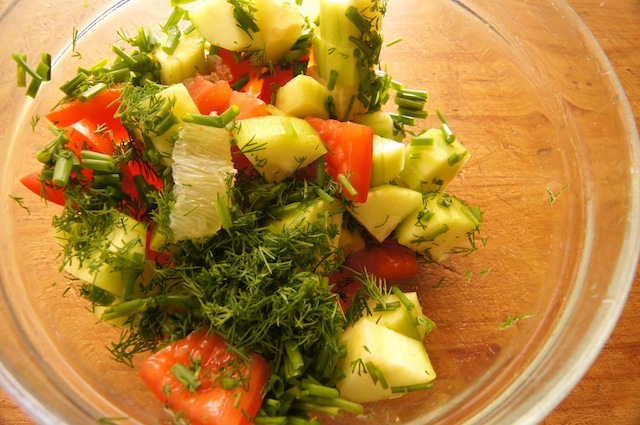 Combine the lemon Supremes, tomatoes, cucumber, chives and dill into a medium-sized mixing bowl. Gently drizzle the yogurt dressing over it, along with any excess lemon juice to taste. Love the lemon supremes idea!